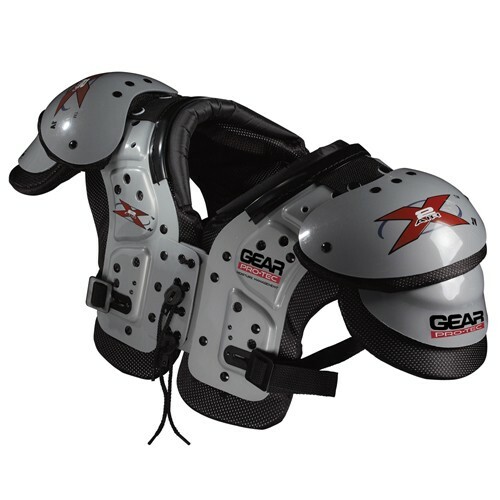 Built for linebackers, tight ends, defensive ends, and linemen, X2 AIR J.V.-F Shoulder Pads are for Youth, Middle School or JV players. 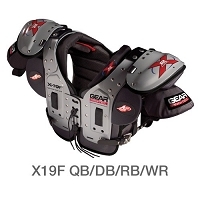 Includes low profile flat pad construction with vented arch plastic, heavy-duty fabric, a unique porous arch foam system that allows drying, non-stretch strap system, front lock stabilizer for sternum protection, and AC joint notch-out with cradle pads. Adjustable Air Release foam clavicle pads include 3 layers of high-density foam with vent holes and molded-in reinforcement. Pro-Loc epaulets for 180 degree range for arms-up motion. 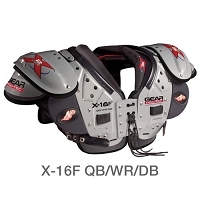 X2 Air J.V.-F Shoulder Pads also provide exceptional moisture management, dry quickly, and withstand odors with antimicrobial fabric. My son has been using a beginner shoulder pad since he began playing. I finally decided that it was time to upgrade to a nicer set. I bought him the Gear Protec X2 Air J.V.F. Shoulder Pads and he loves them. This is a great shoulder pad and I am very pleased with how much easier he can perform wearing this pad.